I love my pets but sometimes, they just SMELL which is why I’ve tried many different odour eliminators. Laundry detergent meant for strong odours is nice but what if you don’t want to wash the cause of the odour? Pet shampoo can do the trick if it’s the pet that smells but you don’t always want to do an all out bath either. I tried these pet wipes (like baby wipes) once but they just made the dog smell stinky with artificial clean smell on top. I was offered some odour eliminators from a company called MrGreen to try out and these seemed different. I was interested in seeing if they were any better. They come in spray bottles, claim to eliminate odours and have a fragrance. I chose to try out the Dog Deodorizer and the Spray Away. The main point that makes MrGreen products different is that they are all natural and environmentally friendly with no bacteria and no chemicals. This makes them allergy and asthma friendly (yay! No more sending my asthmatic daughter away to use an odour eliminator) and are even safe on pet or human skin. Although I have both a dog and a cat, it’s my dog that causes all the odours around here. I don’t know how he gets so smelly but him and his bedding and anything he lays on seems to have an odour. His dog bed can’t go in the washing machine (and neither can my couch or bed) and although I try to bathe him regularly and wash his bedding frequently, it still smells. I love that I can spray the dog deodorizer in his area, without worrying if it lands on him or he inhales a bit by accident. I can even spray it DIRECTLY ON HIM or mix it with water to use for bathing. It claims to eliminate skunk odour too but I thankfully cannot test that. If your odour issues are not necessarily pet related, then you would use the Spray Away. It is also all natural and safe for pet and human skin and is hypoallergenic. Spray Away can be used pretty much anywhere you are having odour problems such as garbage, composts, kitchen, diaper pails, basements etc. It is safe for most fabrics but is not recommended for leather. I use it to spray my couches, carpets and bedding, inside the garbage pails before I put a new bag in and in my basement. The Spray away is safe for pets as well. Spray away is available in Lemongrass, Soft Cinnamon and Tropical Breeze. I was sent the Lemongrass which I thoroughly enjoy the scent of. 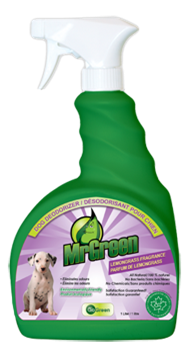 I find that using typical scented products and cleaning supplies give me headaches but I’ve had no problem using the MrGreen products. I also often find the scents of some other products too strong. The lemongrass scent of my MrGreen products, on the other hand, was pleasant and not overpowering. MrGreen products are currently available at Home Hardware in Canada or online. MrGreen also sells other products for your RV, Septic System or the Outdoors. A Giveaway was held 2/15/13 – 3/1/13 and the winner was Dianne G.